The stars of NASCAR won't be the only ones winning during the playoffs; fans will have a chance to win big during Atlanta Motor Speedway's 2018 NASCAR Playoffs Superfan Giveaway, too! 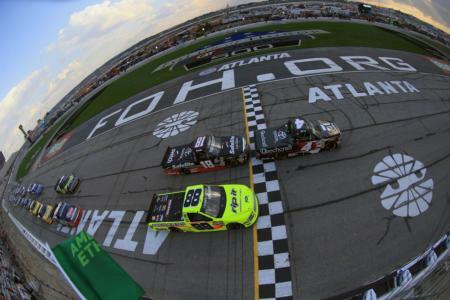 Atlanta Motor Speedway is giving away three rounds of prizes that will make the 2019 Folds of Honor QuikTrip 500 the ultimate race experience for lucky winners. The rounds of prizes will coincide with the three remaining rounds of NASCAR's Monster Energy Cup Series playoffs, with prizes being awarded at the end of each round and new prizes announced at the start of the next round. The first prize up for grabs offers an once-in-a-lifetime NASCAR experience at Atlanta Motor Speedway. One lucky winner and three of their friends will be chosen to wave the green flag for NASCAR Gander Outdoor qualifying at Atlanta Motor Speedway from atop the flagstand! That's an experience that can't be bought; it can only be won! The first round prize winner will also receive Sunday morning garage tours for themselves and three friends, offering an up close look at NASCAR teams as they make final preparations for the Folds of Honor QuikTrip 500. The winner of the first round prize in Atlanta Motor Speedway's 2018 NASCAR Playoffs Superfan Giveaway will be chosen after the checkered flag drops in Kansas on October 21. That's also when Atlanta Motor Speedway will announce the next round's exciting prize! Click here to see the full contest rules and eligibility details. For more information, or to purchase 2019 Folds of Honor QuikTrip 500 tickets, contact Atlanta Motor Speedway at (770) 946-4211 or (877) 9-AMS-TIX.